How do Hartlepool United compare to last season after 10 games? Hartlepool United fans couldn't have wished for a better start to their National League campaign. With the takeover of Raj Singh and the appointment of Matthew Bates, Pools took four games to get going but are now looking a real contender for the playoffs. 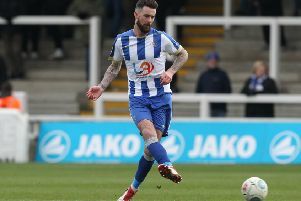 Since the permanent arrival of Matthew Bates in the summer, Pools have become the masters of grinding out narrow victories. In each of their five wins this season, Pools are yet to win by more than one goal having beaten Maidenhead, Dagenham & Redbridge and Havant and Waterlooville by two goals to one. Other wins versus Chesterfield and Solihull Moors have been clinched by single efforts. Compare that to last season, Pools were narrowly losing rather than winning which condemned Pools to just two points from their opening six games. Ultimately, Pools' extra two wins from last terms tally has pushed them into fourth spot instead of 17th. It might not seem much of a difference but Pools have netted four more goals than they did last term and conceded two less. At this stage one year ago, Hartlepool had conceded 10 and it looked to be similar reading given Bates' side failed to shut up shop in their opening six fixtures. However, after trialling it over the summer, Bates' three at the back system is beginning to pay dividends, collecting three clean sheets from their last four. So far, the stats show Pools have a marginal but greater goal threat, firing 12 goals. It is encouraging to see players chipping in all over the park, but it is the quality of summer signing Liam Noble who is emerging as an instant leader and prone goal scorer having already netted five goals. Many wouldn't have been mistaken to think the start of this season felt like de-ja-vu. Pools were winless in their opening four games versus Maidstone, Harrogate, Ebbsfleet and Braintree, however thankfully, won at the fifth attempt. The season prior, it had taken until the seventh game to secure their first victory, which propelled them into a decent run but it shortly turned sour with Craig Harrison being relieved of his managerial duties. This time round, Pools have been clinical to launch themselves on a seven-game unbeaten run, winning five and drawing two.